The Catalan separatist challenge culminated in a unilateral declaration of independence at the Catalan Parliament last October. A move that led to the Spanish government to trigger article 155, taking control of Catalan regional institutions and calling for regional elections. It’s the third in 5 years. It’s been an exceptional set of affairs, leading to a very unusual campaign. The former president of Catalonia, Carles Puigdemont is self-exiled in Brussels, while the former vice-President and leader of the left-wing party, ERC, remains in prison. Puigdemont’s party claims to be the legitimate government. Besides dividing Catalan society, these political-legal wranglings have taken their toll on the independence movement: so do they still agree on unilateralism to achieve their political objective of independence? And who will govern if the independent groups win: Puigdemont or Junqueras? 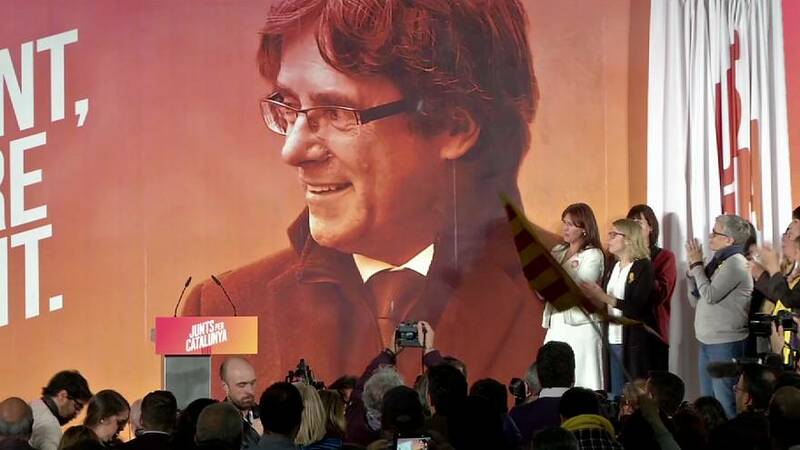 While ousted President Puigdemont insists on his pledge to make the wealthy region an independent state, his former ally, the ERC party have suggested that the party should focus on policy instead. Recent polls show the ERC winning the most votes in the separatist bloc. In the so-called constitutional bloc, the Catalan branch of Spain’s Socialists, PSC, could win 14.3% of the vote, according to the latest polls, which would give them up to 20 seats. Party leader Miquel Iceta, has focused his campaign on job creation and economic growth. Socialists also believe in what they call a “third way” to deal with the “Catalan issue”. The Catalan Socialist Party is against independence, but supports claims for greater self-government and fiscal autonomy for Catalonia. Miquel Iceta, is proposing a broad Constitutional Reform to grant Catalonia a better situation within a truly federal Spain. But federalism is not in the remit of the Popular Party of Catalonia (PPC). And this is the Catalan branch of the ruling conservative party of Spanish PM Mariano Rajoy, insisting instead on the unity of Spain above all. In a highly polarized campaign between the independence and the pro-unity camps, some parties seek to put an end to these divided blocs. Barcelona Mayor Ada Colau’s Catalunya en Comú is running without a clear stance on independence focusing instead on the social agenda. According to the polls, their ambiguity will probably make them lose some votes. However, they might be key to gaining a governing majority. Leading the pro-unity camp is the Citizens party, Ciutadans. Their presidential candidate, Inés Arrimadas has taken a strong stand against the secessionist push, which has captured voters who want a resolution to a crisis that has seen the region stripped of its autonomous powers. Taking everything into account, a united majority looks difficult to achieve. And without agreement it will lead to a political blockade and new elections. Albert Rivera’s party Ciudadanos, will also need support to form government. The ballot, which was aimed at healing the wounds and ending the deadlock in Catalan society is looking increasingly likely to result in a hung parliament. The polls foresee a high turnout and a tie result between parties in favour of the independent movement and those that oppose it. Agreements and negotiations will be key to elect the next President of the Catalan government Generalitat.